A pioneering training programme for physician associates provided by Plymouth University has welcomed its first students. Physician associates are a new healthcare workforce in the UK and much needed in a changing NHS. There are a number of factors that have increased the need for physician associates - for example, the harmonization of the Foundation Programme will take junior doctors out of acute hospitals over the next few years into community placements for training; and there will be a peak of GP retirement in the next few years, yet not enough GPs are being trained to meet the demand. While the role of physician associate is new in the UK, it is well-established in other countries, such as the United States. Physician associates are healthcare professionals who, while not doctors, work to the medical model of clinical diagnosis, with the attitudes, skills and knowledge base to deliver holistic care and treatment within the general care team under defined levels of supervision. The role is designed to supplement the medical workforce, thereby improving patient access. 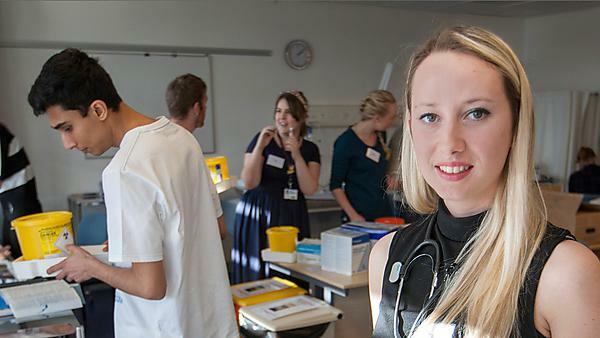 The first cohort of 17 physician associate students at Plymouth University come from a variety of backgrounds, including biomedicine, nursing, emergency medicine and other professional healthcare disciplines. One such sponsored student is Victoria Black, 24, from Plymouth. Victoria is one of five students supported by South Devon Healthcare NHS Trust, the Trust which runs Torbay Hospital. Victoria is very much a Plymouth success story. She went to school at Estover Community College in the city and has always wanted a career in medicine. She is the first person in her family to follow this career path – her mother is a civil servant and her father is employed at Devonport Dockyard. While at school she took part in a volunteer trip to Tanzania where she taught English and worked in a local hospital and orphanage. In order to pursue her dream she spent her late teens volunteering at Derriford Hospital where she gained experience dealing with patients, in the hospital’s laboratory and working as part of the wider care team. At 18 she gained work experience as a carer in a nursing home, and she worked as a part-time carer while she studied biomedicine at Plymouth University. On graduation she took up a post as a trainee biomedical scientist at Derriford Hospital, from where she joins the course.